For those interested in the application of the power of Binah in their own lives, it is possible to draw upon the strength of Binah and Chochmah on a personal, individual level. For example, I might one day conceive of the idea that I could become a world-class jewelry designer. This is Chochmah granting me the great idea of my individual potential. As I reflect on this idea, I commune with Binah. She inspires me as I consider the logistics of becoming said jewelry designer. How will I learn about gemstones? Who will teach me metallurgy? Where must I go to learn bench techniques? Where will I turn for business know-how? I must also consider the ramifications of failure and success. Both require a conversation with Binah, who inspires me to be honest with myself about the process and my own limitations. This type of rumination will help me determine the obstacles I will face along my path. One day, if I find myself sparked to passion by the ins and outs of jewelry design, and if I overcome all the obstacles in my way, these conversations with Divine Understanding will have transformed that initial gift of potential into a thriving jewelry design business. Perhaps you'd like a daily reminder of the importance of contemplation, consideration, and rumination on the divine sparks of potential and insight that come your way. May we recommend purchasing a ring, brooch, or necklace made with peridot? August's sacred yellow-green birthstone will remind you to take the time to consider those lofty ideas that sometimes enter your thoughts as random, crazy ideas. Perhaps one of those ideas, as you contemplate it in communion with Binah, will take form and manifest itself beautifully in your life. 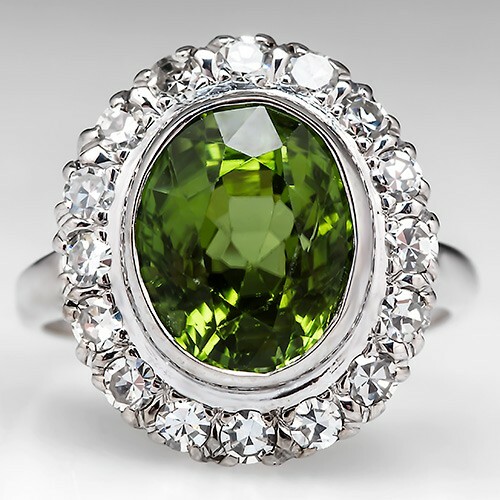 "Chrysolite - The Golden Green Counsel of God," God's Chemistry Set Blog, July 23, 2012. Kunzl, Hannelore. "Jewish Artists and the Representation of God." Representation in Religion: Studies in Honour of Moshe Barasch, ed. by Barash, Moshe, Jan Assmann, and Albert I. Baumgarten. Leiden, The Netherlands: Koninklijke Brill NV, 2001, pp. 149-160. Swart, Jabus G. The Book of Self-Creation, Volume 1. Gauteng, South Africa: The Sangreal Sodality Press, 2009. Besserman, Perle. The Shambalah Guide to Kabbalah and Jewish Mysticism. Boston, MA: Shambalah Publications, Inc., 1997. Samuel, Gabriella. The Kabbalah Handbook. New York: Penguin, 2007, p. 54. Are You a Modernist Bride?